Business people talk about upsetting. It’s a tried and true technique to get customers to buy more, usually higher-margin items or services. The reason it works so well is that you are selling to someone who already knows and likes your product or service. Many businesses sell lower priced products in order to pull in customers and upsell the company’s main offering. Not every customer, however, is open to or needs the item you are trying to sell. Some will be perfectly happy with the lower priced entry item. So what should a businessperson do when the customer only wants the entry product? Take the sale. Think about the grocery store. 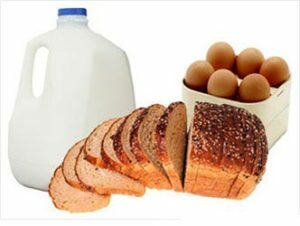 What brings the most people in are milk, bread, and eggs. The grocery has much higher priced and higher margin items that they want people to buy. Would the grocer turn away the customer that only buys milk, bread, and eggs? Of course not. They may want you to buy specialty meats from the butcher and exotic fruits and vegetal;es, but they won’t turn down the customer just buying milk, bread, and eggs. Business owners and salespeople can get caught up in pushing the items they want to sell, instead of focusing on what the customer wants to buy. Sell the customer what they want. Remind them periodically that there are other items they may be interested in, but sell them what they want. Don’t worry about what you didn’t sell, take the sale that’s in front of you.